At last, Combine's mightest Ogre is available. The Ogre Mk. VI has rumbled onto the battlefield. Ok, this one's been delayed a few times, but it's here now. This behemoth stands almost two inches tall, just over 3-1/2 inches long and nearly two inches wide. 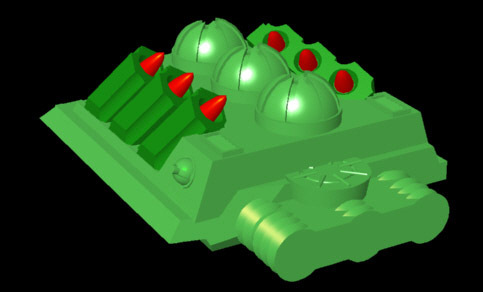 Bristling with three main guns, six secondaries, and a nine-missile "Death Wave" burst, the Ogre Mk. VI is the final Ogre of the series. They simply don't get any bigger than this. The Combine Laser Tower is back! First released in Combine Set 9, the tallest structure in the Combine arsenal is now available through Warehouse 23. Long-time readers may remember our resin-related difficulties with this piece, and the hideous delays that accompanied it. Combine Set 9 is still OOP, unfortunately, but we've gathered just enough for Warehouse 23. This piece has a resin base, and a metal top. The socket is wide enough to allow the metal top to sit securly, even without glue. It stands about 3" overall. For complete rules, as well as more buildings, visit the Combine Structures page. Also, I'd like to apologize for missing the Laser Turret announcement. Yep, the Combine Laser Turret is now available through Warehouse 23, and I didn't mention it here. I'm an idiot. Jack Wendt has seen the Galahad, and he likes what he sees. Read his full review of the Galahad GEV Macroture at Starship Modeler, complete with glorious pictures. Friday June 6, 2003: Jammers Rule! If you've always thought the Jammer got the short end of the stick, rules-wise, then jump over to the North American Combine Structures page. The new rules are strictly optional, and have barely been tested. So if you like 'em, if you hate 'em, or you just can't understand 'em, let me know! Thursday May 22, 2003: Macrotures! Yes, it's true. Macrotures are here. Most of you have seen the Daily Illuminator already, so you know what I'm talking about. For the rest of you, Macrotures are 1/60 scale Ogre vehicles. For a good feel of the scale, check out the picture to the left. Yep, that's a full sized Ogre Mk. V sitting next to the Galahad. As usual, send your thoughts on Macrotures, the page design, the photography, or my mother to: paul@sjgames.com. And hey, thanks for buying Ogre stuff! Have you seen David Morse's website, Command Post Gamma? He's got scenarios, he's got photos, he's got strategy articles! 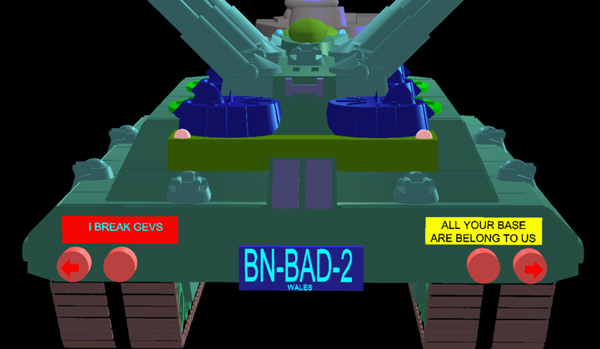 Heck, he's even got a silly cybertank designer. It's finally here! The largest Ogre ever produced, the Mk. VI sports three main guns, six secondaries, three missile racks, and six external missiles. This gives this Ogre a nine missile strike capability. 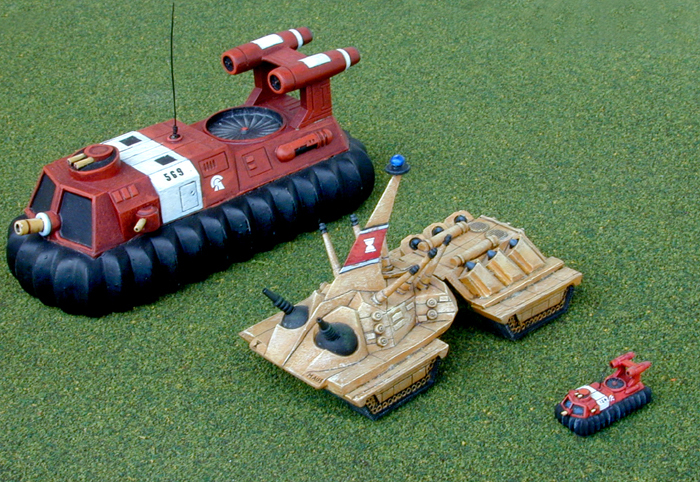 Plus, when ramming, the Mark VI destroys any armor unit, including the Ogre Mk. I! The Ogre Mk. VI will be available next month from Warehouse 23, and will add 250 points to your army. Starship Modeler has a review of the Ogre Mk IV up. The reviewer says some nice things, and points out a flaw or two (I'm working on the tread problem ASAP). But most importantly, he shows off his awesome paint job! And while you're there, browse around on the site. They do an excellent job of covering the entire spectrum of hobby modeling. Since I've been thinking about the Doppelsoldner and its little brother the Fencer, I've been shuffling through some old files, and found this image. This photo was created by Steve Stratton. Friday January 31, 2003: A Step Towards Ogre? Christopher Shields sent in this link to an article on Popular Science's website. It looks like the U.S. government is investigating extremely small nukes to bust buried bunkers. Let's see – nuclear weapon, guided by GPS, designed to punch through meters of earth and concrete (or inches of BPC)? Yep, that's an Ogre weapon! After the overwhelming support for a revised Ogre Mk. VI that poured in after the last images of that cybertank, we let the playtesters gnaw on a few designs. The rules were simple: the 3 mains and six secondaries stay, and the Mk. VI and the Doppelsoldner must remain equals. 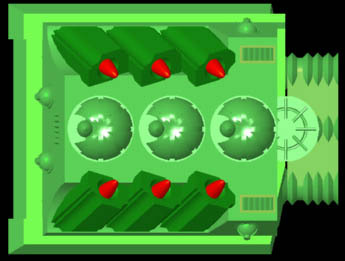 The result is what you see here – 3 missile racks, supported by six external missiles. The Dopp's changes are similar, but a bit of playtesting is still ongoing, so I'll wait to announce those. A big "thank you" goes out to the playtesters, especially the first wave who had the difficult job of convincing me (and SJ) the change was needed. Thanksgiving has come and gone, and that means Christmas is on its way! What does that mean here in the minis factory? Other than the normal end-of-year inventorying, we'll be out of the office for between December 24 and January 2. Warehouse 23 will still be open for most of that time, but shipping has a few restrictions. If you want your Ogre Mk. IV to arrive in time to be under the tree, December 9 is the cut-off date for postal deliveries. If you can accept UPS, December 16 is still OK. However, if you're willing to lay down the cash for Next Day Air Delivery, you can make an order as late as the 22nd. As always, if you're concerned or have questions about your order, check with Cyndy or Michelle in Warehouse 23 for details. Ah, heck! I still need to do my shopping, too! There is currently a debate being held, focusing on the Ogre Mk. VI. What's wrong with the Mk. VI? Well, the missile racks have too many missiles, which make them a high-value, long-range, low-defense target. Basically, in every battle, a smart opponent will kill the missile racks first, which dramatically shortens the striking range of the Mk. VI. What can be done to fix this? Many variations have been put forth, but the playtesting is focusing on a Mk. VI with 3 missile racks, and six external missiles. We'll see what happens. If you'd like to get in on the fun, check out Henry Cobb's Ogre list, one of the Yahoo Ogre groups, or Pyramid's Ogre board. Just as a teaser, here's a list of the Ogre buildings we have scheduled for 2003. These buildings will, of course, be available in both Paneuropean and Combine versions. The Ogre Mk. IV is now available for preorder! Just jump over to the Mk. IV page to see the newest Combine unit, and then follow the links to Warehouse 23 to order! The Mk. IV will be available to retailers directly, but if you need it now, we'll be shipping them on November 15th. Yikes! That's this Friday! On the horizon, we've got more new Ogres (the Mk. VI and the Vulcan are in the design stage) and new Ogre buildings, including the tough to find Combine Laser Towers. And for pure rumor-mongering, I thought I'd mention our talks of 28mm figures in the Ogreverse. Now, what game would those figures support? Monday May 20, 2002: Ogre Lite! Need a quick reference sheet for your next big Ogre tournament? Like to have something to remind your casual players of the unit stats? Check out Ogre Lite, a double sided sheet covering the basics of Ogre Miniatures. Print it out, make copies, and keep it handy as a unit reference guide and tactical primer for the newbies in your game. The first review I've found of Ogre Scenario Book 1 is at RPG.net. Mr. Watson had some nice things to say – thanks! If you see another review of OSB1, or any other Ogre product, let me know! The first Ogre Scenario Contest was such fun, we decided to do it again! The rules are simple. You create a scenario for the GEV map and send it to us. We'll choose the best of the bunch. One scenario will be Numero Uno, and will win a fabulous shopping spree – $100 worth of loose minis from Warehouse 23. Two Runners-up will each receive $50 of loose minis, and the Top Seven will be published in Ogre Scenario Book 2. All seven contributors will receive two copies of the book, one signed by the Original Ogre himself. We'll be judging each scenario on fun, balance and creative use of the GEV map. Being able to play the scenario with just the contents of Deluxe Ogre and Deluxe GEV will be a bonus, as will flavor text. All basic rules should be found in the Deluxe GEV rulebook; optional rules from Shockwave, Ogre Reinforcement Pack, Battlefields, or Ogre Miniatures are acceptable as well. "House rules" are very iffy – include them at your own risk. The style from Ogre Scenario Book 1 is now our official Ogre scenario style, so be sure to use it. We also require an electronic submission, in one of the following formats: Word (preferred), TXT, RTF, or Claris. All submissions become the property of Steve Jackson Games. Scenario submission deadline is 20 February 2002. Steve Jackson Games or its appointed representative shall be the sole judge of this contest. For complete rules and contest updates, click here. It's here! Ogre Scenario Book 1 has arrived, and we're shipping it out as fast as possible. Special thanks go out to the authors of the scenarios: Alvin Helms (the winner of the contest), Peter Lowter, Kevin Henson, Barry Stockinger, Chris DelliCarpini, C. Andrew Walters, and David Valenze. All the scenarios can be used for both boardgame and miniatures games, and are referenced in the classic Ogre style for easy reference. 7 scenarios for just $6! The perfect stocking stuffer for your favorite Ogre fanatic – you! Tuesday November 6, 2001: Battlesuit on the Auction block! Yipes! Almost missed mentioning the copies of Battlesuit on the SJG Auction. A stack of components was discovered, and we had just enough complete sets to put together a few. Originally, there was a group of 8, now they're down to the last 4. The bids are currently between $20 and $30, but if you've got a gap in your collection, now's the time! Thursday October 18, 2001: Ogre Scenario Book, Not Just for Metal! Over on Pyramid, SJ has posted bits of Ogrethulhu for comments. If you like Cthulhu and Ogre, you'll like this. Weird and wonderful, that's the only way I can describe it. Over on Pyramid, home to all playtests great and small, we've posted the text to a chapter of Ogre Scenario Book 1. If you're a Pyramid subscriber, stop on by and let us know what you think. Friday August 24, 2001: Ogre Scenario Design Contest Winner! Back in March, we (along with Wounds Unlimited) ran an Ogre Scenario Design Contest. We'd like to thank everyone who entered a scenario. While many of them were good, and several of them were very good, we have finally narrowed it down to one, final submission. "Hammer & Anvil," written by Alvin Helms, is our grand prize winner. Congratulations, Alvin! "Hammer & Anvil" will be the first scenario in Ogre Scenario Book 1, due out in December, but you can see it early, in this week's issue of Pyramid. If your scenario didn't win, don't worry. The runners-up will have a spot in OSB1, and will receive a copy of the book for their mantles. You can't spell "progress" without an Ogre! 18 November 2000 - Looks like the Combine will be using Armored Cars after all... See the CNN story. 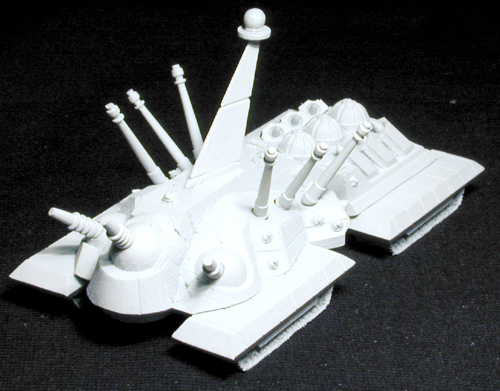 14 November 2000 - All Deluxe Ogre components are now in production, and the first sets ship next week! 1 August 2000 - They haven't announced it on the Illuminator yet, but it looks as though GURPS Ogre just shipped... at least, I got my shipment notice today from UPS. Warehouse 23 carries both GURPS Ogre and the Ogre Radiation Bundle, which includes pretty much everyth ing currently available for Ogre, barring the miniatures rules. Check it out! Also – The Daily Illuminator today (3 August 2000) has some nice pictures of some Ogre Miniatures setups from Dragon*Con. Hopefully a prelude to lots more miniatures action!. 13 July 2000 - According to today's Daily Illuminator, SJ Games has decided to create their own in-house miniatures casting division. Their first product will be 1/300 scale Ogre Miniatures units! There's a page already set up for the miniatures division, and updates will probably be posted there first. 11 June 2000 - Shockwave has shipped – if your local retailer doesn't carry it, you can even order it online! Also available online are the Ogre Blueprint Poster, and pre-orders of the Ogre Reinforcement Pack, which is currently at the printers, and should ship on 19 June. 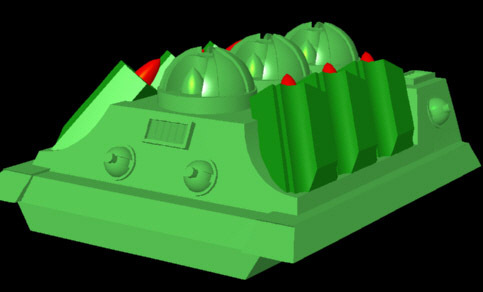 11 May 2000 - Shockwave has gone to the printer, and should ship soon to a Command Post near you. You can pre-order your copy now! 12 April 2000 - Christopher Shields has created an excellent new fansite dedicated to Ogre/GEV – including original art! It's still under construction (what isn't, on the Web), but it looks very promising indeed. Check it out! Stephan Beal has created a site which includes a utility for providing multiple Ogre record sheets, as well as allowing you to build your own. 3 March 2000 - All the recent excitement over the upcoming rerelease of Ogre/G.E.V. has prompted me to finally get off my derriere and type in Philip Rennert's excellent article on Tournament Ogre/G.E.V.. It's more of an article on strategy and force choices in Ceasefire Collapse than on tournaments especially, so check it out! 29 February 2000 - For all you Ogre Miniatures fans out there... a rerelease of official miniatures may be in the works, but for the moment you may wish to check out Stan Johansen's site – he has many miniatures that may masquerade well as conventional vehicles. Thanks to Chris Doherty of the Pyramid message boards for the pointer. 24 January 2000 - The Ogre Timeline doesn't mention when BPC armor plate was developed... Perhaps it was in the year 2000? A new material, known as 3DPETM, has been developed, with possible armor applications (among many others). Check out the press release on EurekAlert. 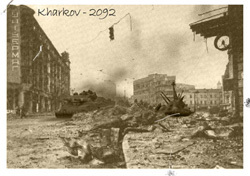 30 December 1999 - Nearly Y2K... do you have your battlesuit ready for the inevitable conflict? A new Ogre site has hit the web: Francisco Cestero has built a very nice site, complete with new designs, an alternate future history, and an Ogre design system... Check it out! 26 July 1999 - Stephan Beal has thoughtfully created a smattering of new hexmaps... most of which would work fine as (small) GEV maps. You can find them at the Free Generic Wargame Maps Page. The Ogre has left the Building. 29 June 1999 - Congrats to Jon Berg, who won the bidding for a copy of the Ogre computer game! 15 June 1999 - There's a copy of the Ogre computer game by Origins for IBM or Tandy on the auction block. Check it out – gotta get that radiation patch. 15 September 1998 - It's been over two months since I lasted posted anything, and I've no good excuse. Sorry. Anyway, here's what we have for you: Badlands, a scenario for Ogre played on a Necromancer map (with slopes! ); The Four Howitzer Defense in Ogre, by Chester Hendrix, which is a classic article on... well, on using four howitzers in Ogre; and Warren, Jim Gould Left This in My Mailbox, which is simply a spreadsheet of new units – lots of new units. Not all are believable... Comments by Steve Jackson are included. 16 September: Today, for your delight, we have Riding the Shockwave: Analysis and Strategy, by Philip Rennert, which is chock-full of commentary and advice on the units and scenarios included in Shockwave. 2 July 1998 - Invisible spring cleaning has been continuing apace the past month. More importantly, however, I've received most of the old articles from The Space Gamer, and I'll be putting those up on the site as I can get them typed in. Posted today are Endgame (fiction by J. D. Bell), Ogre Update, the revisions from First to Second edition Ogre, and Ogre: A Review, by William A. Peterson, the first review ever published of Ogre. A hearty thanks to all those who contacted me about the maps I requested; I appreciate your help. 7 June 1998 (Updated 8 June) - Besides some invisible spring cleaning (fixing links and such), I've managed to get a couple of scenarios posted. Namely, Kill the Howitzer, by Garth Getgen, and (an oldie here) Badlands, which uses the map from Necromancer. Unfortunately, we don't have this map online at the moment, so unless you have the map it's probably not going to be of much use to you. 8 June: Posted today are an old classic: The Four Howitzer Defense in Ogre by Chester Hendrix, and some fiction: MacGregor's Maxim by Jack L. Thomas. 5 June 1998 - Posted today: an addendum to the New Units page, entitled (strangely enough) New Units, Mark II. Also posted is a scenario by William Spencer entitled Under the Sea. 31 May 1998 - First in a series of scenario postings, we have The Mecklenburg Gamble, from the first issue of one Drow magazine, which was thoughtfully posted to Henry Cobb's list by Paul O'Grady recently. More to follow. Also, if you happened to miss the last news article, the old Pyramid articles Godzilla 2076, The Factory States, and Destroy All Ogres have been reposted, after being lost for a while when Pyramid went online. 29 May 1998 - The old Ogre articles in Pyramids 1, 2, and 5 have been reposted – Godzilla 2076, The Factory States, and Destroy All Ogres. Enjoy. Incidentally, the damage tables for Mothra and Ghidrah aren't there yet; they've been temporarily misplaced. They'll appear soon, we promise. 8 March 1998 - After months of relative silence, we're back. Ledon Cook has been kind enough to scan and send us lots of the art from the original Ogre games, so we'll be scattering that about the site over the next couple of weeks. Other than that, there are a couple of new units waiting in the wings for me to post to the New Units page. Umm, I'd like to have more to say after such a long hiatus, but I've run out of The Space Gamer articles to HTMLize (so if you have any that I don't, send me an email and we'll see about putting them up). In the meantime, until somebody write a new article (hint hint) for me to post, you're out of luck. Sorry. 18 November 1997 - Well, Richard Meaden seems to have been hauled away by the Men In Black again, and I personally am not inventive enough to come up with new material, so... Anyone have anything that they'd like posted? Write it up in article format (I've seen some nice stuff on the boards already, so there's some stuff out there) and send it in, so we can put it up in a nice pretty HTML format for all of posterity to enjoy and love. 21 September 1997 - The Ogre message boards have been changed slightly; I turned off hard wrapping when posting, so that lines are no longer automatically truncated to fit the window; this should make it easier to embed HTML tags into a post, should anyone wish to do so. If this causes anyone problems, email me and we'll see what we can do. Obviously, we haven't posted much for the past couple of weeks. Sorry about that... Hopefully we'll get some new material up soon. Does anyone have any Ogre-related articles (from The Space Gamer or elsewhere) they feel like photocopying and sending me so I can post them? If so, drop me an email and we'll post those. An article on basic Ogre strategy by Steve Jackson, called (strangely enough) Basic Ogre Strategy. An article on playing the defense in Ogre, by Michael Nahas, called (again, strangely enough) Basic Ogre Defence. A scenario (ooh! ooh! scenarios!) for Shockwave, also by Steve, entitled Operation Newspaper. Another scenario (I don't know who wrote this one), Badlands, using a Necromancer map. And if you're wondering just where you're supposed to pick up a copy of Shockwave, well, there's one available at NOT AVAILABLE AT YOUR CLEARANCE. 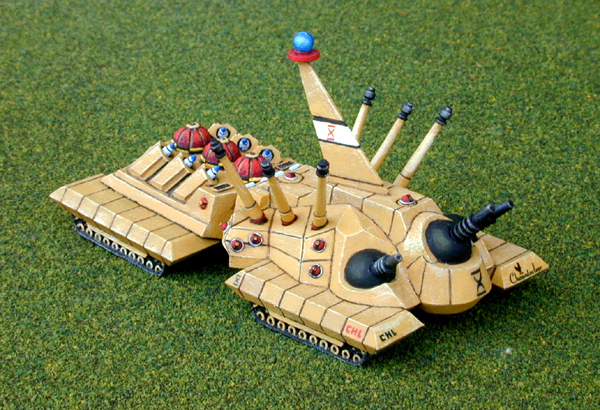 29 August 1997 - Steve Jackson's article The Golden BB is now on the web. More ways to kill Ogres... I've got a couple more articles in the wings just waiting to be HTMLised; as I find time I'll be putting those up, probably by the middle of next week at the latest. Oh, and: Todd Zircher's PBEM/mapping aid V_Map has been officially released to the public. It includes a tileset of Ogre/GEV/Shockwave counters, as well as the maps from those games. Check it out! It's free! It works! – Fish Flowers, Ogre website peon. 26 August 1997 - Just posted today: A whole bunch of new and variant units, including a couple by the man himself. A little tale for your amusement by J.D. Bell. A new Ogre scenario featuring the Fencer Cybertank: a little twist on the Advanced Scenario (comments are welcome). And last but certainly not least, a couple of additions to the Ogre Minis errata that have been long-outstanding. Keep those nukes flying, and remember: If you really wanna drive offensively... get an Ogre. 8 August 1997 - We have a fledgeling page devoted to Play-by-email support up now. Hopefully this will eventually grow into a place where people can post information about PBEM games they're running or want to run, and as a clearing-house for information for PBEM play. 1 August 1997 - I posted Continental Siege Aircraft and Playing the Odds in Ogre/GEV today. The first is a set of rules for aircraft and flying Ogres, and the second is an article on tweaking the force allocations to get the most out of your shots. Pretty soon I'll have gone all the way through The Ogre Book, and then where will I be? Check back often and find out! Oh, and in case you missed yesterday's news flash, remember to check out Icepick! 31 July 1997 - Icepick, by Craig York and Steve Jackson, is a three-part article from Space Gamer 68, featuring a guide to map-bashing, some short fiction, and a GEV scenario. We're very pleased to bring it to you again – it should be a very, err... cool addition to your next GEV game. 29 July 1997 - Just posted today: Another #$%*?!! Ogre Article, by Steve Jackson, is a hodgepodge of all sorts of stuff. Plus, Steve admits to a mistake! (Gasp!) The Uncertainty Principle, by Brian McCue, is a way to play an Ogre using the draw of cards (for solitaire play), and a system for keeping opponents in the dark as to damage. And, also by Steve Jackson, we have GEV - A Designer's Introduction, which is a nice long article (took me forever to type in) with lots of information and some interesting fiction. July 24, 1997 - Two more articles from The Space Gamer posted today – Tank: Present, Future, Ogre, by Charles R. Bowles, is a description of how the Ogre might come about, and Ogre: A Review, by Robert C. Kirk, was one of the very first reviews, with some notes on basic Ogre strategy. Both of these are from early issues of The Space Gamer, and more from the same era will be posted as we continue on our quest to HTMLize all the old articles and put them online. More to come. July 23, 1997 - One of our goals is to post all of the old Ogre material from The Space Gamer. One of the first articles we've gotten posted is Stephen V. Coles' Duel, mainly because it's short. Another fine addition is Steve Jackson's own original designer notes article, entitled Notes on the Ogre. Hopefully lots more will be going up soon . . . But for now, enjoy these articles from way back in Space Gamers #9 and #10. June 10, 1997 - Thanks to Mike Smith, in Texoma, who provided me with a couple of samples of the original Martian Metals Ogre Miniatures packaging . . . and with enough information that we can nail down all the original MM stock numbers. We've updated the Ogre Miniatures checklist accordingly! June 3, 1997 - We now have some Ogre message boards available; this is in an alpha-test stage, so please report any problems to the webmaster. Meanwhile, post away... the boards have several main sections, including a general discussion area, new units, scenarios, opponents wanted, Ogre minis, and PBM. Check it out! April 30, 1997 - The history of the Last War is now online, thanks to Ogre line editor Richard Meaden. More Ogre support (and further Last War historical material) will be coming soon. April 11, 1997 - The U.S. Air Force plans to deploy a fleet of seven laser-firing 747s by 2008, at a total cost of $11 billion. Each plane will carry a single laser, fired through a glass nose turret, capable of knocking down a Scud-type missile a hundred miles away. Theoretically, a laser plane would orbit well outside enemy airspace, to detect and destroy missiles within a minute after launch and drop the debris in enemy territory. Obviously, the laser plane itself will be a prime target; tactics and technology for protecting it will no doubt be a subject of intense speculation . . .